I know this seems like a no brainer, but I think we all get caught up in life and forget that it's the simple things that are most important and have the biggest impact. I also heard about what was being said and done between friends, and his take on different situations. It gave me a chance to be on his level and to discuss things. Have you had conversations where there has been plenty of dosing off on their part? The ones that are all about things you are interested in. Mine seemed to always be about getting their chores done, being nicer to brothers and sisters, homework, friends...you get the drift. It was like a switch in their brain turned off as I started talking. So....while you're in a discussion they're actually listening to (pokemon), now is the time to (carefully) make comments that they will hear. Maybe a comment about how you hope they remember how they felt when they were treated a certain way, whether it's bad or good, so when they're in that situation they'll know how to act. Don't go off on a tangent, just simple comments so they'll want to come tell you things again. When you're talking about things that they are interested in, they are listening! When my older kids were young, my husband and I would take turns tucking different kids in at night. It would always involve hearing what happened in their day. They told us one thing that made them sad, three things that made them happy and one thing they did for someone else. If we had two kids sharing a room, they knew it was ways an option for one of them to go to our room so they had (private) one on one time. We always ended by singing a few songs (song my mom and dad sang to me at bedtime, some of my best childhood memories) and listening to prayers. As the kids got older, schedules got more involved for them and for us. Our bedtime routine slowly got dropped out of our schedule because #1 our lives were getting crazier, and #2 I was exhausted by bedtime. The night usually ended with us saying family prayers and telling the kids to please hurry and get in bed. One child it seemed, would always end up getting told, "If I see your face one more time before the sun is up, you're going to be sorry!" I later read that the last thing you hear at night before you go to bed you actually hear in your mind over 100 times- mother of the year award right here!!! As weeks turned into months, I realized how much I missed that time with my kids. I talked to my kids about it and found out that they really missed it too. Yes, even my 18 year old son! We were going to make this work! Pathetic I know, but we actually had to make up a schedule of who gets tucked in by which parent. Unfortunatly, the option of each kid getting this nightly isn't available right now. So instead, each child gets one night with mom and one with dad each week. On their off nights it's just a hug and a kiss (unless they request one on one time because something is going on they need to talk about). We went through and figured out which nights worked best with each child. Wednesday night is activity night at church for my three teenagers. By the time they get home, finish up any last minute things on their homework and get ready for bed, they get a hug and a kiss goodnight. So that makes it the younger two's turns. We just went day by day and figured out a schedule that worked for us. It even got written on the calendar so we wouldn't forget! It's AMAZING the things I have learned while laying on the floor of a child's room in the dark. They will tell you things there that they won't tell you any other time. Bedtime is a GREAT time to talk, but you're kids need to know that you're ALWAYS available to them. So....what happens when you feel like you don't have time to talk??? There were (& still are) many times when I've had a child who wants to talk when I didn't have time right then. I learned early on, when they're ready to talk, you have to be ready to listen. 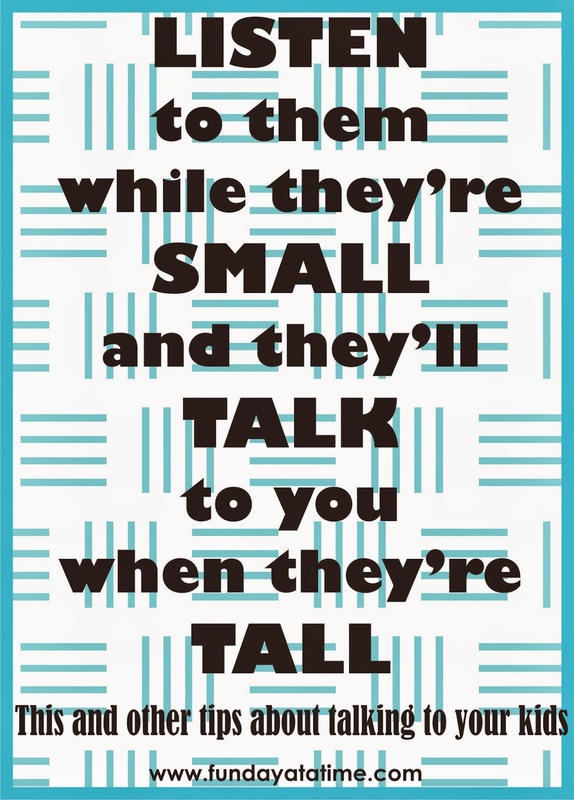 If they can't talk to you, they'll find someone else to talk to and they may not be giving advice you'll like. If I'm just running an errand and they can ride with me I'll take them along. If I'm heading somewhere but they can't come, I'll have them call me on my cell so we can talk while I drive. If I'm just at home but have stuff I need to do I'll have them follow me around the house & help me as we talk. I've heard many interesting things while pulling clothes out of the dryer, or putting clean sheets on the bed (& they've learned new skills while they were talking). Then there are the times that you're not at home and can't be reached by phone, that's when your "notebook" comes in to play. Each child has a notebook with their name on it. At times when you're not available, or maybe they need to talk to you about something and are nervous about it. They write in their notebook and leave it in a place you chosen (ours is on my bed). Then when I have a minute, usually before bed, I read what they wrote and write back to them. When my 18 year old was in second grade he had a notebook that we would write back and forth to each other in, working on his writing skills. I noticed right then it was doing a lot more than just improving writing. Think about your friends, how do you get closer to them? By talking and confiding in each other. You do have to be careful to not let it turn into a gripe session of you telling them what to do. Listening should be happening more than talking. A lot of time they don't really need a problem solved, just someone to listen & be excited, sad, happy (or whatever else) with. I have been a sounding board a lot lately, adding tips here and there when I felt I could get away with it. Kids are just like husbands, if they think it's their idea, it's always a great idea. So, put hints and ideas out and let them figure it out. Whatever you do, make sure what is said is kept in confidence. They won't be open and honest with you if they think you're going to turn around and tell someone else. I remember getting "caught" telling my friend what I thought was just a cute story my daughter had told me. I got a death glare and the silent treatment the rest of the day. It took me months to gain her trust back. So before you share an experience that isn't yours, make sure you have permission. Another time besides bedtime I hate to miss out on is as they're coming in the door from being somewhere. Whether it's school, work, a date, hanging with friends, whatever. 99% of the time as my kids walk in the door the first word out of their mouth is "MOM!" I love it and I wouldn't have it any other way! They are usually ready and egar to talk as soon as they get home and if I'm not there I miss it (this is where cell phones or the notebook come in to play also). I am very lucky to have a schedule that allows me to be here when they leave for school and get to be here when they return most days. This is a listening time for you! You may need to ask a few questions to get them talking, and it may not come easy at first, but don't give up! Don't ask, "How was your day?" unless you want to hear, "Fine". Ask a question that will spark conversation, "What did you do at recess today?" or "What did you do in your choir class today." If you ask a question that can be answered in one or two words, more than likely that's what you'll get. If you ask a question that requires actual conversation and they know that you really care, you'll get conversation (this won't happen all at once, don't give up). I want my kids to come to my hubby and I. Whether it's good/bad happy/sad, I chose to be a mom for a reason and I want a close relationship with my kids. This doesn't just happen! It takes work, lots of work. But anything worth having doesn't come easy! Actions speak louder than words...so go show them you love them and that you want a relationship with them! What are you waiting for, get off your computer and go talk to your kids! I spoke way too soon....I have bookend boys and my youngest just got into Pokemon! Lucky for me ALL the Pokemon cartoons are on Netflix! Your posts are awesome and gives great ideas to parents. You truly learned from one of the best; your mom and dad, and you too are very impressive.